CRL Feb-18 update – Is it going off the rails? There’s been a spate of news about the City Rail Link recently and not all of it good. Late on Tuesday evening, City Rail Link Limited announced that one of the two shortlisted bidders withdrew from the process for the biggest of the contracts, the tunnels and stations from Wyndham to Mt Eden. The release of tender documents for the City Rail Link tunnels and stations will be delayed by up to three months following the withdrawal of a preferred bidder from the process. CRL chief executive Chris Meale says while the withdrawal is disappointing it won’t prevent progress on the CRL tender and discussions have already started with another prospective bidder. It is too early to tell if the three-month delay will roll on into the current project completion date of early 2024. This is a serious and concerning development. I was hearing late last year that the companies unsuccessful in their bid to get on the shortlist had been informed. These companies won’t have had their project teams sitting around and they’ve likely already been split up and are now working on other projects. You have to wonder how this will also change the dynamic of the tender process as the other ‘preferred bidder’ likely has a big advantage. Does this make it more likely that we’ll end up paying more for the project and/or have less chance of getting some of the much needed features included, like the Beresford Square entrance and future proofing for longer trains? As for who’s pulled out, no one is saying officially but the rumours are that it is Fletcher, which would be unsurprising given the challenges the organisation has had of late in other divisions. CRLL say they’re already talking to another of the bidders but won’t say who it is. Below is the list of the initial eight bidders. Vinci Construction Grands Projets S.A.S (VCGP) joint venture. All up a far less than ideal situation to be in. We can only hope this doesn’t delay the project further. Just a day earlier, CRLL were boasting about the development potential of the project, saying about 200,000m² of it is possible on the land after they’ve finished. That is broken down as 65,000m² of commercial land and 130,000m² of residential which is enough for 1,400 new dwellings. About 4.6 hectares at Mount Eden including road reserve and the land acquired for the main construction yard, station and trenches. 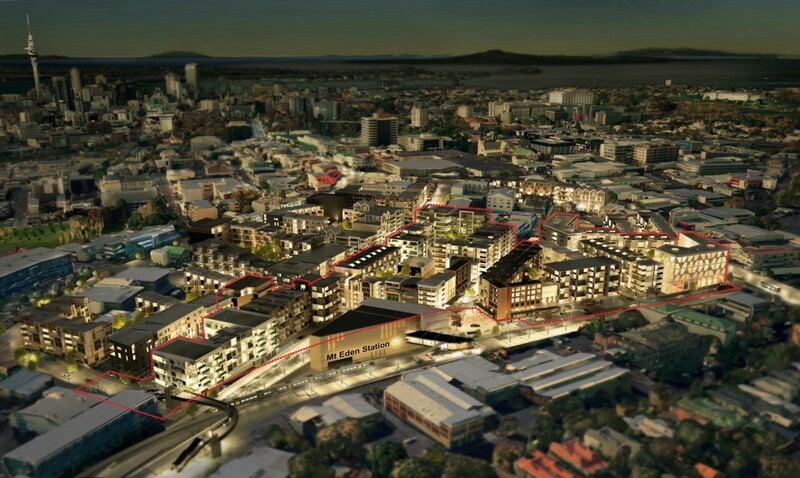 Mt Eden is where the largest area will be available for development, both on CRL land and on neighbouring land. I wonder if this will end up being a site the government choose to develop as part of their plans for more housing? There are a few more images of Mt Eden on the CRL website. At Karangahape Rd there is development possible above the station but one interesting element is that there’ll be a new laneway between Mercury Lane and East St. There will even be space at Britomart, likely on the site of the current, temporary station entrance. It’s worth noting that the value of the redevelopment this opens up wasn’t something that is able to captured in the economic evaluation for the project. Late last year it was announced that the CEO of CRL project, Chirs Meale, would retire. He was the one who once infamously stated that we didn’t need an entrance at Beresford because the steep walk up Mercury Lane is “good for you”. City Rail Link Limited Chief Executive Chris Meale has announced he is retiring from his role next year (2018). Mr Meale, who has led the project for five years, has previously stated he would step down in early 2018 when the project’s future was assured and was in a stable position for change. The rumour mill is suggesting that the hunt for a new CEO isn’t going well which is a shame because we could really do with some fresh thinking around issues like the Beresford entrance before any contracts are locked in stone, although it doesn’t appear that will be a problem any time soon. Whilst there’s been plenty going on ‘off the pitch’, work has continued on the parts already underway. On Albert St the trench is still being dug out but at the southern end they’ve started to build the tunnels within that. This is full of speculation and an absolute educated guess. But can we likely assume it’s Fletcher Construction who have pulled out? I know its the Building Division that has had troubles recently, but I’m also sure they have gone through all divisions to minimise any current risk. My kiwisaver provider has unfortunately put a little of my retirement fund in Fletcher, I would rather put my cents on Fletcher as being the withdrawerer of the CRL. It would be nice if another local company could fill the gap. And on a technical point, if they shortlisted two, and one has disengaged, then surely the decision is made? 2 – 1 = 1? So get on with it. I imagine they will want to use the leverage of having two companies involved to drive the best deal they can get. While delays are frustrating opening a substandard expensive CRL in March 2024 would be way worse than a well designed CRL in Sep 2024. We have to get this project right. Isn’t the CRL supposed to open in 2021? No, since funding was agreed it has been planned to open in 2023, although that appears to have slipped to 2024 in some recent publications. I asked Matt this myself the other day… current timetable is for the CRL to be operating in late 2023, but there will still be some bits that form part of the overall project finished off in 2024. Don’t think this pull out is a worry. Be interesting when it first opens if we get trains running through a station but doesn’t stop while the station is finished off. Maybe Aotea would be last to actually open for example. Interesting reading. The Aotea development was exciting to hear about! I hope that they integrate the station and street level with a retail presence (a la Hong Kong, among other places). I imaging that the cost of any lease will not be cheap! Incidentally, did you really mean cubic metres for all the measurements? They should make it compulsory to have retail along exits. Nearby new development’s resource consents should make it a requirement. Retail on ground makes sense, until you over dimension the available space. This is where NZ Inc has a history of screwing up – Under or over estimating demand. Aotea though – It’d be pretty hard to overdo the amount of retail space on the ground floor. I mean, come on – Who wouldn’t want to have a captive audience of thousands per hour walking right past your shop front? That laneway across East Street will be really useful. A direct link from the LRT station to the Metro station on to the bus stop on K Road Bridge. It is a pity Fletchers pulled out. Their shareholders have been very generous to us all lately, building us the Christchurch Justice thingy below cost and now the unwanted Convention Centre in Auckland. They seem to be following the example set by the shareholders of Mainzeal who gave us all a great deal on the Auckland Arena. Maybe the generous spirit stems from an understanding of their origins. They should make sure that one of the new buildings has a public escalator from Shaddock Street to Mt Eden Road. Trade off extra height if necessary. It will make the hike up the hill much more bearable. K road exit should have a escalator that goes to k road level to make it less a steep walk. Yes, it should have an escalator going to K Road level, the escalator should be in the Beresford Sq entrance that AT need to actually build. 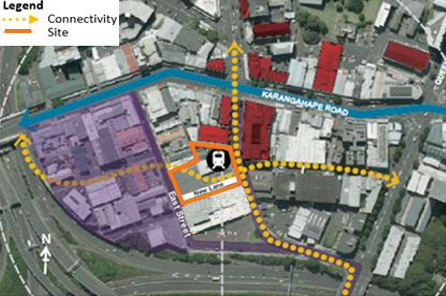 Its Auckland Council and the Crown who are building CRL not AT. You need to lobby the mayor.